If the walls of historic Vanderslice Hall could talk, they would tell the stories of famous students who created, designed and inspired at the Kansas City Art Institute (KCAI). They would speak of the lavish Beaux Arts Ball in the 1930s, featured in LIFE Magazine, elephant rides on the lawn for Morgan Day in 1970, and painting sessions with faculty member, painter and muralist Thomas Hart Benton. The three-story, 26-room building is the epicenter of activity for KCAI. 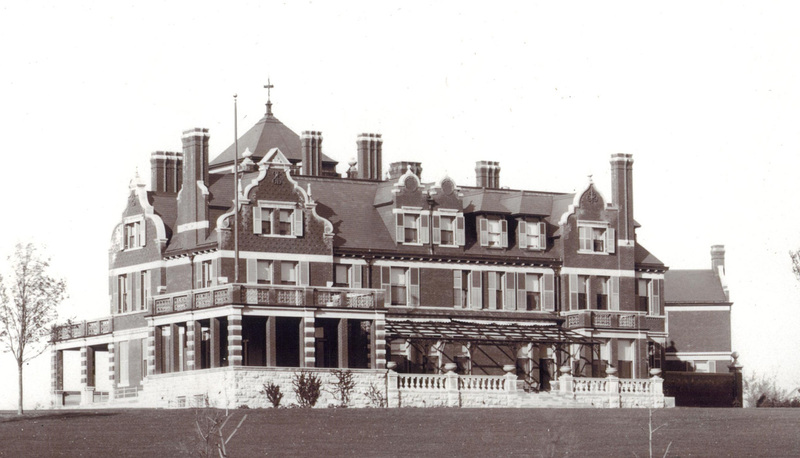 The mansion was built in 1896 for the family of August Meyer, industrialist and Kansas City’s first president of the Board of Park Commissioners. Originally called “Marburg,” the palatial home is listed on the National Historic Registry and was designed by the architectural firm of Van Brunt & Howe as an excellent example of Flemish Queen Anne architecture. It sat on eight acres of lavishly landscaped grounds featuring rare plants from around the world, a Japanese garden and koi pond. Marburg was renamed Vanderslice Hall and the first classes were held there in September of 1928. Epperson Hall, now known as Epperson Auditorium, was added onto the building in 1930 to provide a community space for presentations and lectures. Thanks to support from the William T. Kemper Foundation, the historical integrity of Vanderslice Hall is being restored. Last year, Kirk Gastinger of GastingerWalker&, an award-winning historical preservation firm, oversaw the exterior restoration of the mansion. After an extensive review of mortar was completed to ensure it matched the original, master craftsmen tuck-pointed the building by hand. All the stone work was carefully power-washed or gently hand scrubbed. 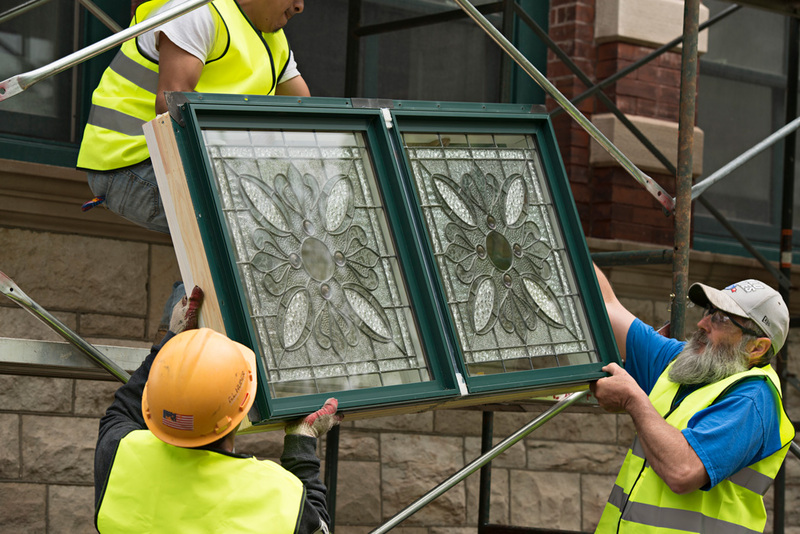 Historic art-glass windows were removed, cleaned and replaced, and new thermal pane casements were installed. This spring, work will begin on the new Mildred Lane Kemper Terrace, to be dedicated in her memory. The south terrace will become a gathering space for the campus, and a new awning will be reconstructed to add functionality to the area. Historic photographs show that the south terrace had a long and wide canvas retractable canopy/awning to provide shade, large planters and electric lanterns, and a very different paved surface. This visual record is guiding the renewal work by GastingerWalker& and ties it into a renovation of the Vanderslice reception rooms. 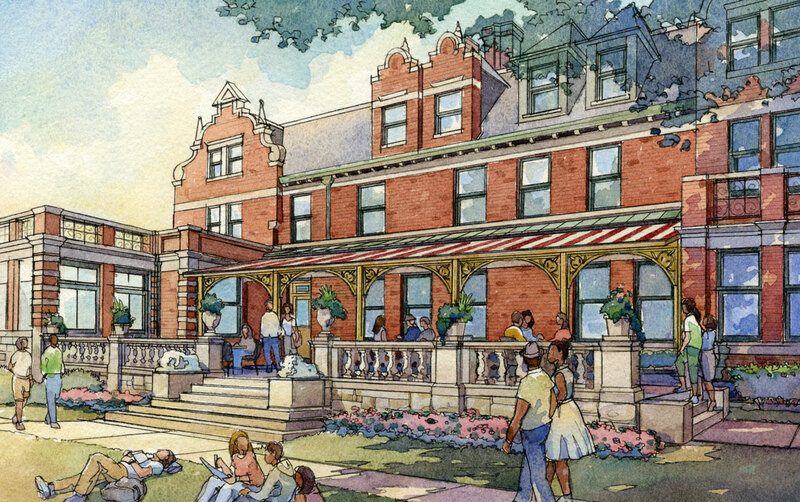 With the help of a gift from the Dickinson Family Foundation, the whole ground floor will have a new hardwood surface, while the walls, fittings, furniture, lighting and color scheme of the reception rooms will give grandeur. New French doors will connect Vanderslice reception rooms to the outside terrace and create a natural flow in and out of the two spaces. “After its completion, probably by mid-August, the Mildred Lane Kemper Terrace will once again be a lovely social hub providing beautiful views of the campus green,” said Tony Jones, The Nerman Family President.